Thomas P. "Tip" O'Neill, Jr. (1912-1994 ) was the Speaker of the House from 1977-1987, preceding James Wright and succeeding Carl Bert Albert. He is most famous both for being one of the longest serving Speakers and as a highly influential leader of the liberal Democrats in Congress in the days of Ronald Reagan. He served as Congressman from Cambridge and the Boston suburbs, 1953-87. O'Neill came from a working class Catholic Irish family, and always stayed cloe to his roots in the neighborhoods. He greaduated from Boston College in 1936 and immediately plunged into state politics with election to the legislature. After a 16-year career in the state legislature, O'Neill was elected to replace John F. Kennedy in Congress when Kennedy moved to the Senate in 1952. O'Neill was an astute backstage politician who was famous for negotiating deals in general, with little interest in any specific programs. He moved up the ladder rapidly, with appointment to the Rules Committee, election to the #3 position among House Democrats as Majority Whip (1971–73) in a coalition with Hale Boggs. When Boggs died in a plane crash O'Neill was elected Majority Leader (the #2 position), 1973-77. With the retirement of Carl Albert he became Speaker (the #1 job) in 1977, serving ten years until he retired in 1986. He was an effective party leader, holding tighter reins than the two previous Speakers, Albert and John W. McCormack. O'Neill broke with President Lyndon Johnson in 1967 on the issue of the Vietnam War, which was highly unpopular at Harvard and MIT, two schools in his district. O'Neill could not abide President Jimmy Carter, a Democrat he considered incompetent, and Carter got little of what he wanted from Congress. O'Neill is best known for his confrontations with fellow Irishman Ronald Reagan. Although O'Neill had a nominal majority, 242-192, Reagan kept his Republicans in line and added enough conservative Democrats to defeat O'Neill and pass most of Reagan's conservative programs, especially the tax cuts of 1981. The two fought bitterly over policy in Central America. O'Neill, Thomas P. with William Novak. 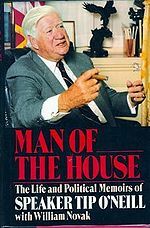 Man of the House: The Life and Political Memoirs of Speaker Tip O'Neill. (1987). This page was last modified on 12 September 2016, at 19:25. This page has been accessed 7,890 times.